It is snowing here, has been since early morning. So, we are holed up and, since it is the weekend, there is no point doing anything more on the project list until Monday. Just for fun, I started a charcoal of a fish on a 19 by 26 inch sheet. That’s it above. One of the things that you need to know if you are going to make art is when to stop. Calder, when asked when he knew a piece was done, was said to have replied, “When it’s dinnertime.” It is not dinnertime here yet, but I am told that there is tea. And, I also happen to know that there are cookies. So, this fish is finished. 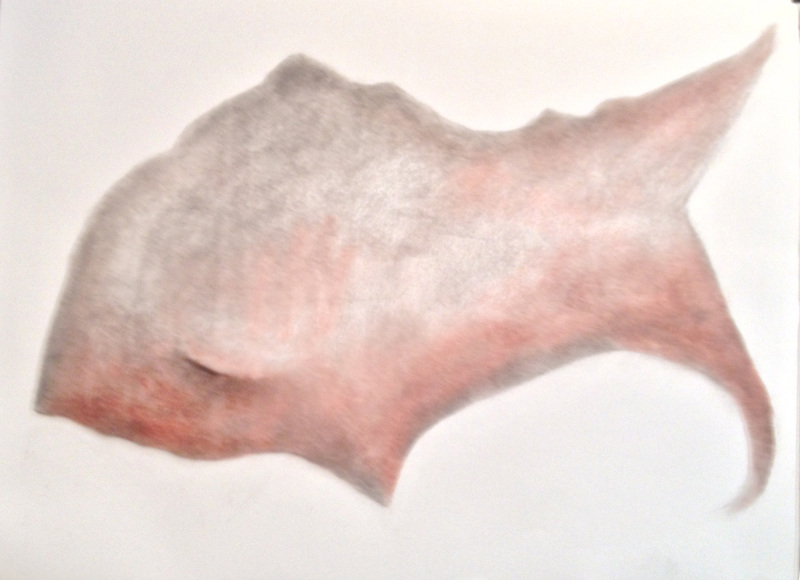 It is done with charcoal and sanguine Conte stick, worked with a piece of chamois. Chamois is highly recommended for dry color such as Conte, charcoal and pastels. This entry was posted in Uncategorized and tagged Alexander Calder, charcoal, fantasy, figure drawing, spontaneous, things you need to know. Bookmark the permalink.